The Toad Stool by Alan Wolk: Adweek! 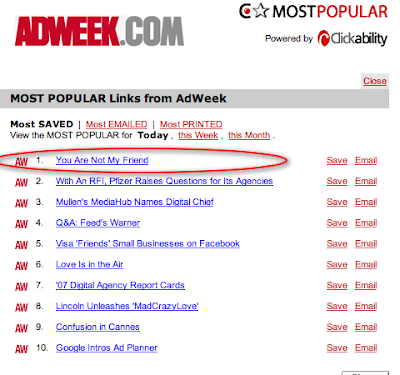 Adweek ran a version of my popular piece "Your Brand Is Not My Friend" (albeit with a slightly different headline) on Monday in both the online and offline (print) editions. I was particularly thrilled because it's a chance to get my ideas in front of a brand-new audience, especially those marketers and agency types who don't read blogs. And as the above chart indicates, they seem to like it. Like a reformed tax-and-spend politician who's suddenly seen the light, ad agencies are busy telling anyone who'll listen that they're not about selling anymore.